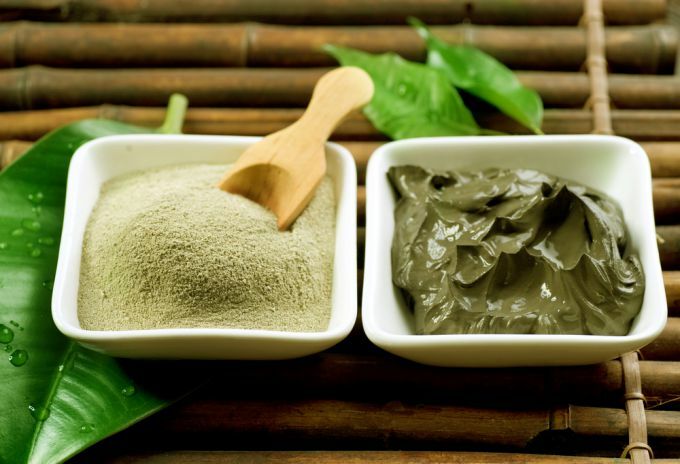 Rich in various components, clay has found wide application in the care of face skin and hair. Its color is determined by the presence of iron oxide and minerals. Blue, green and red clay will help fight the fatty hair. Green clay has proven its effectiveness not only in the fight against excessive sweating, but also with such an unpleasant phenomenon as dandruff. It includes silver, calcium, magnesium, zinc, which promote the normalization of metabolism and hair strengthening. Red clay – the choice of those who own a sensitive scalp. For a few treatments you will notice how it calms the scalp, especially after applying aggressive chemical hair dyes, restores the pH balance and improves blood flow. The easiest way to prepare a mask is to dilute it with a small amount of water to a convenient consistency. To make the mask multifunctional and even more useful it is possible, if you replace water with a decoction of herbs, enriched with vitamins E, A and B. Increase the effectiveness of clay masks can be replaced by regular water soda. The resulting mixture is applied to the hair, wrapped in a plastic bag or put on a shower cap, warm it with a towel and leave it to work for 30-40 minutes. When washing the mask, always use a shampoo, rinse the hair with a decoction of chamomile. The effectiveness of the mask can be observed with regular use at least 2 once a week. To prepare the next mask in a ceramic bowl, combine two tablespoons of water and green clay, add 1 a tablespoon of apple cider vinegar to the mixture. A similar effect is provided by a mask of 2 tablespoons of blue clay, diluted with water, a tablespoon of lemon juice and 2 garlic cloves grated. Both masks are applied to 30 minutes under a polyethylene cap and washed off with plenty of warm water. If you do not have enough time to use the mask, pay attention to the clay rinse recipe. A tablespoon of blue or green clay, dilute in 0,5 l of warm water. Rinse the hair with a solution and after a lapse of 20 minutes rinse with clean water. Clay is a unique cosmetic product that can become even the basis of a means for washing hair. For the preparation of "shampoo" take 3 art. l. clay and in accordance with 4 art. l. apple cider vinegar and pure water. Blend the mixture on the roots of hair and massage 5-8 minutes. After washing off the product, you will appreciate the high absorbing properties of the clay and its ability to cleanse the scalp. Reduce the oiliness of the scalp and nourish dry tips of hair will help mask from 3 st. l. clay, 1 tsp. honey, yolk and yogurt. Until a homogeneous consistency, rub the honey, yolk and clay. Blend the mixture with water, brewing green tea, infusion of herbs or non-fat kefir. Apply to hair for 30 minutes under a warm terry towel, rinse thoroughly with water. Prepared clay masks are not subject to storage. Mix the green clay with sesame or olive oil, 3-5 drops of essential oil of lemon or calendula. Apply the mixture for 40 minutes and rinse with water with a little shampoo. You can talk about the first results after 5-6 procedures.